Sicilian pistachios just before the harvest. 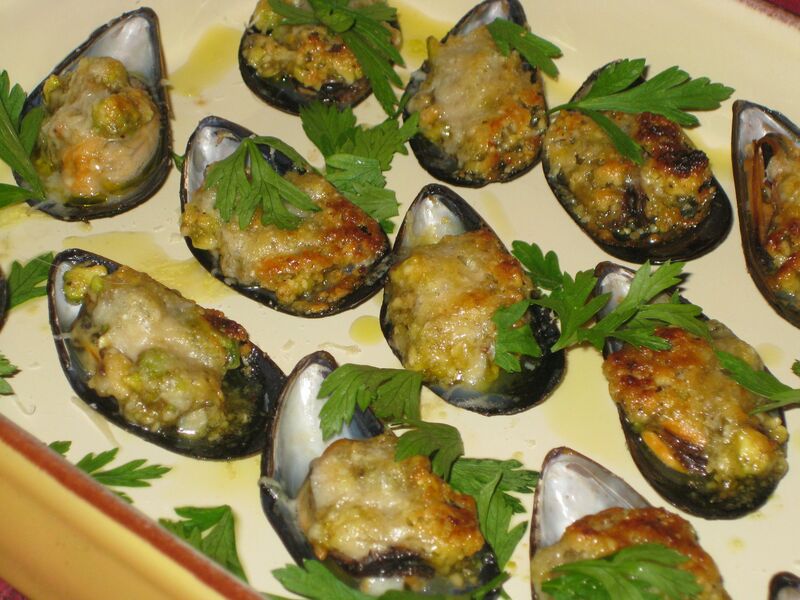 Recipe: Mussels with Sicilian Nut Pesto. Now, I would imagine you feel the same way about this. What good cook wouldn’t? I go a little ballistic when I purchase nuts only to bring them home and find that they’re rancid. It’s such a common problem in this country. It’s terrible. And nuts are expensive, especially pine nuts. The nuts I use most often as a Southern Italian cook are pine nuts, almonds, pistachios, and walnuts. Walnuts are almost always somewhat stale when I buy them at a regular supermarket. I think Italians respect nuts more than we do (although I also think we respect people who are nuts more than Italians do). In any case, Italian cooks demand high quality in their food, as we all know. Possibly the problem in the U.S. of A is that most people eat nuts mainly as a snack, where they’re so highly salted you can’t even detect their staleness. Nuts are rich in oils that go off quickly. Their antioxidant qualities, which are fairly high in most kinds of nuts, are lost when they go rancid. In fact, eating stale nuts is bad for you, because they’re now oxidized and releasing free radicals (I think that’s the way it works). So it’s not just a matter of taste. Although taste is very, very important. Most mid-price supermarkets—I’m talking decent places but not high end—routinely sell rancid nuts, usually packaged in plastic takeout-type containers. I bought pine nuts from West Side Market the other day and they were bitter and inedible—and expensive. And it’s hard to tell from looking. Since the containers are sealed, you can’t exactly sample the product. Walnuts are almost always bitter and rancid at supermarkets. At Buon Italia, in the Chelsea Market (and at buonitalia.com), the nuts are shrink-wrapped and extremely fresh. Most of them come from Italy. In my experience, and I’ve been shopping there for years, they’re always in great condition. Kalustyan’s keeps most of its nuts in covered bins, but the turnover must be very high, for I’ve never purchased rancid nuts from them either, plus you can sneak a taste to know for sure. 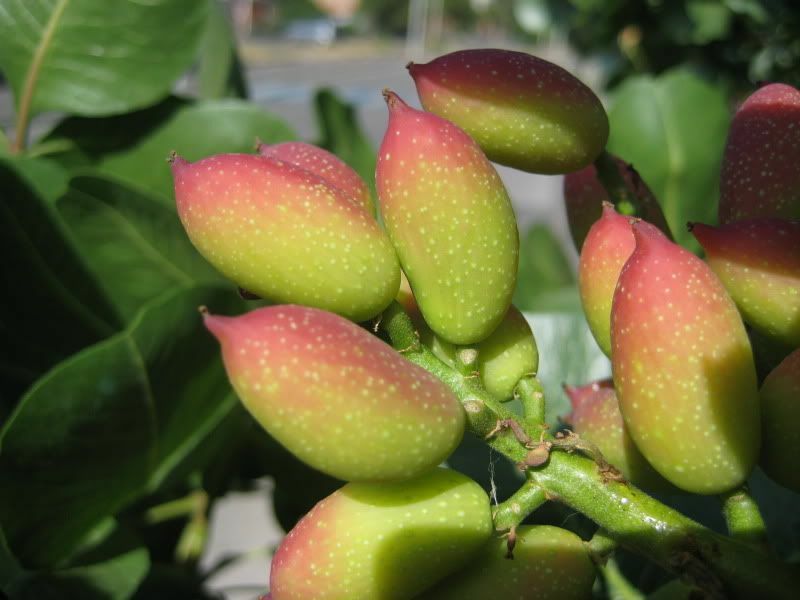 They also carry the very special Sicilian pistachios that are still grown around Mount Etna, in the Bronte area. If you can get your hands on some of those, you’re in for a treat. I guess the only solution to this nut problem is to shop at great places. Use any nuts you buy quickly, and store them in the refrigerator to somewhat slow down their spoilage. Also, I buy small quantities, just to make sure they don’t hang around too long unused. Sicilian nut pesto is classically used to dress pasta, but I’ve found that I absolutely love it with shellfish. There’s something about the blend of the mollusks’ brininess and the creamy richness of all the nuts. It’s a really wonderful combination in both taste and texture. Put all the nuts and the garlic in the bowl of a food processor. Pulse a few times to give them a rough chop. Add about 1/4 cup of olive oil, salt, and the lemon zest, and pulse a few more times, just until you have a very rough paste (you want to keep some texture). Place the mussels in a large pot with the white wine, and turn the heat to medium high. Cook, stirring them frequently, until they open, about 4 minutes. With a big strainer or slotted spoon, lift the mussels out of the pot and transfer them to a bowl. Let them cool a bit. Strain the mussel cooking liquid into a small bowl. When the mussels are cool enough to handle, remove them from their shells. Then choose the nicest looking shells, and place one mussel in each. Add about 2 tablespoons of the mussel cooking broth to the pesto, and give it a stir. Top each mussel with about a teaspoon of the nut pesto and then with a little of the grana Padano. Place them all on a sheet pan or in a shallow baking dish, and drizzle them with a little fresh olive oil. Run the mussels under the broiler, about six inches from the heat source, just until the cheese starts to turn golden (you don’t want to burn the nuts), probably about 2 or 3 minutes. Arrange them on a serving platter (or keep them in the baking dish), and garnish with the parsley leaves. Serve hot. Have mercy on us ! Could you prep us lowly readers for the oncomming deluge of summer eggplant and zucchini ? So good to hear your voice. Missed you in Barcelona. HOpe all is fine. There’s a more complete version of Sicilian nut pesto, actually made for pasta, on an earlier blog. Maybe better for spaghetti (it’s penette with pistachio and almond pesto- see above for link). And yes eggplant and zucchini recipes galore coming up. Wish me luck. I’ve got an interview with Lidia Bastianich today. She’s opening a cooking school.